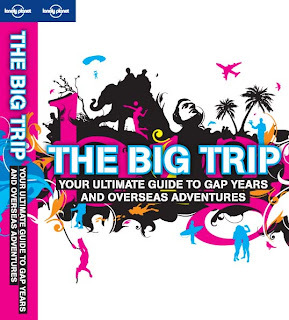 Just got word from the folks at Lonely Planet, that this cover is the final version for the Big Trip book, I've been working on for the first half of this year. It's always amazing to see covers, but this one packs in everything about travel - elephants, parachutes, trekking and a guy busking just near the letter 'b'. I really like it and hope the rest of the book has the same design snazz throughout. Working on this book was actually lots of fun and I got to feed in more ideas for design and other other elements than I normally would. I got to research topics that I'd taken for granted like visas, packing or safety from the perspective of people who'll be doing it for the first time. It reminded me of how bnervous I was the first time I set foot in another country. One bit of advice I didn't give was my own terrible packing method which usually consists of throwing things at the bag for a week before I go and hastily realising I haven't got anything useful the day before. It's maximally inefficient, but as I'm once again looking at heading away with not enough socks I'm trying to remind myself that you can always buy anything anywhere and they can turn into strange souvenirs when you're home again. Looks good! I will keep an eye out for it in the bookstores. BTW, when are you off to China?